Making a Return or Exchange? It's simple. We're sorry your order did not work out, so lets us make things right! First, read through our Returns Policy, then follow the Return Instructions with images on how to send it back. We're confident that your Upbra® bra will fit great and make you feel amazing, or we'll make it right. If the size you receive does not work out for you, we are always here to help; included in all domestic orders is a prepaid return label for your return until you get the right size. Make sure the center cleavage control straps are unhooked and bra/swim straps are included for all returns or you will be charged for a restocking fee for damage, missing parts, or signs of wear. For refunds, it will be issued back to the original credit card. Initial shipping charges are non-refundable. Please allow 3 business days for us to process and ship out exchange(s), and 10 business days for a refund to process through from the date in which it is received. Items marked as Seconds/Slightly Imperfect Upbra® bras are not eligible for a refund. Items marked as Second/Slightly Imperfect Upbra bras/swim. Returns received after 30 days of original received date. Size of the Upbra bra you're returning. Please call us at 213-884-4980 so we can help you better. Fill out your return form, which was in your package, and located right on the back of the packing list. Package up the unhooked item* you are returning back, along with the return form completely filled out, and in its' original packaging. Cover any old stickers on box. Use return address label located on the back of the return form at the top right hand corner. Seal up the box. 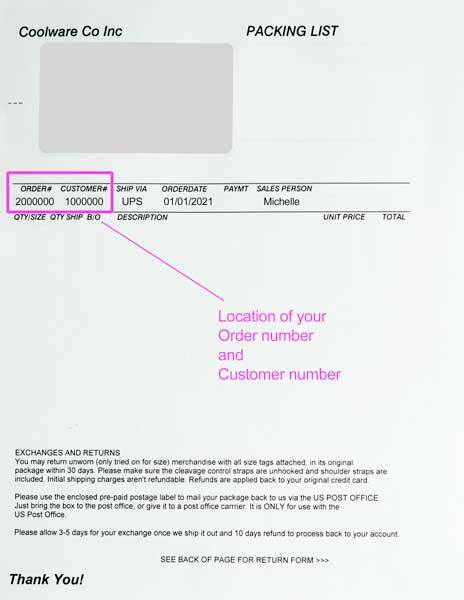 For domestic orders, stick the prepaid return label that was included on your package to cover the old postage. For international orders, go to your local post office to apply the correct postage and mail it. For domestic orders, go drop off your package at your local post office with all stickers adhered. What if I lost my return form? You can print out another one by clicking here. Where do I find the return address label? The return address label is for returns. See diagram at the right labeled "Return Address Label". This a return address label just in case the package needs to get redirected back to the original sender if there is a problem during shipping and NOT a prepaid return label. For domestic orders, no, there will be a prepaid return label included in your shipment. For international orders, yes, but we pay for the postage for exchanges shipped to you. It typically takes about 10 business days from the day we received your return to process through. How long does it take for an exchange for U.S. orders? We usually ship exchange items out in about 2 days after we get them. If the item is out of stock, we will contact you. If you need to speed up your exchange's turn around time, we recommend that you send the tracking number to show that the package is on the way back to us. Contact us via email to send us a copy of the return postage receipt or tracking number for the package, and let us know the exact item you would like to get in exchange and when you need it. How long does it take for an exchange international orders? We usually ship exchange items out in about 2 days after we get your package back. Please remember that transit times vary. If the item is out of stock, we will contact you about the delay. If you need to speed up your exchange's turn around time, we recommend that you send the tracking number to show that the package is on the way back to us. Email the tracking number to us and let us know the item you would like to get in exchange. By doing so, we will be ready for your package and can let you know if there are any problems with the timing that you want.